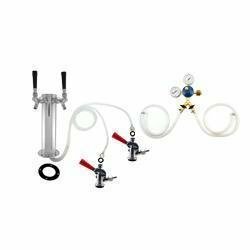 This kit contains everything you would need to dispense two types of beer at once. Just make sure that the fridge you want to use is large enough to hold two kegs. The kegs must sit perfectly flat. Used to dispense most domestic beers. Does NOT include air tank. Easily convert this to hold your home brew kegs too. Features: * The double tap chrome tower is a sleek and simple way to pour from 2 kegs * US Sankey system dispenses most domestic beers (can be converted for any other type of keg tap. Includes * Double tap chrome tower * Two-product double gauge regulator kit * (2) plastic faucet knobs * Air lines and beer lines with connectors * (2) Lever type US Sankey keg couplers * Does NOT INCLUDE air tank. Check out the low flat rate shipping too!